A warm welcome to Anarcha Quinn today as she shares with us a post on the power of art in the current day context here in the US–although I believe that you will find this post easily translates to anywhere in the world. It’s a vitally important post, and I’m so glad to be able to share it with you today. Image descriptions are at the end. For many of us, the places and the spaces we inhabit have changed monumentally since election night. Where we fit. Where we sit in society. How our fellow human beings care for us or don’t — all of that has been shuffled. Reshuffled. Even shaken down to the core. This is only gotten more so after January 20, when the results of that election came to fruition. For me, as a 30-year-old woman with a disability, this was acutely the case. While many of my friends expressed solidarity with the Americans among us of different racial backgrounds, religious persuasions, sexual orientations, ages and financial situations, there was a screaming emptiness. It was caused by the one demographic I didn’t see mentioned in those words of solidarity. In those words that acknowledged the worth and value of those lives, and their right to be lived. The disability community. Over and over again, I saw that our lives were not even spoken about. The lives we would lose due to a loss and health insurance; the homes and cozy spaces we would lose to a lack of benefits; the lack of respect and attention that would only grow worse under someone who openly mocked us. It’s not just that our lives didn’t seem to matter. It was as if our lives didn’t exist at all. And, I suppose they don’t. To most people without disabilities, my life — or a life with any disability — isn’t worth living. That life is less. Pitiable. I hear and see this reflected back to me in TV shows, books, movies and yes, the eyes of those who watch me roll by. So of course. Where a life is seen as undesirable it isn’t going to be acknowledged that it exists, is it? It’s not going to be cherished or treasured. Defended by others. You can’t defend or value something you don’t acknowledge, can you? If you don’t see its point—its purpose—that life, that person would ever be considered “one of you” will it? It won’t. And it wasn’t. At least, not outside of the handful of disability online groups I am a part of. And for a few days it was unbearable. I kept looking at my newsfeeds and saying to myself, “What about my life, dammit! What about our lives? Do they even deserve mentioning?” I found myself parking my wheelchair in front of my front door at night, for fear someone might come and get me. Might drag off my worthless, unmentionable life and leave no word behind. Worse than that, I began to question the value of something I hold slightly more dear to me than my own life: my art. Where was the place for that? Where was the need? When my life wasn’t even being acknowledged by the people and places that had nurtured me for most of my 30 years on this planet, was there any reason to write? Was there any reason to tell a story? For a few agonizing and colorless days, days with yet more proof that my disabled life wasn’t worth getting excited or scared over, it seemed there was no reason. No space for any book I might write, poem I might pen, or article I might compile. But a few more days passed, and something happened. I embraced the damning silence in my predominantly able-bodied world. The moment I did so, something broke open in me. Flooded me with an empty space. A place for a reminder. A memory. As an English major in college, I read many books. Predominately literature, from men, women, people of color and many more. But, despite the array of subject matters, perspectives, and styles, one thing remained the core of each book: the power of that book to give acknowledgment, presence—value—to the person writing. To that demographic, and how, once then began to happen, those lives mattered. Whatever those lives were—the life of a Chinese bride going through foot binding, the African American slave, the number-obsessed awkward girl next door—they began to be recognized. Valued, because there was something being said about them. And the person who lived it, was taking the time to chronicle that life, that event, that suffering. In their own words. And by doing so, that person has now made a way of making real and necessary their existence, the existence of their oppression. And when an oppressed demographic makes real and necessary a life that they live, it forces people who do not live that life to sit in recognition of it. Which can begin to give that uncommon, other life value, right? Give it space and a place to exist, which forces our fellow humans who do not walk in our shoes, roll on our wheels to make space for us. And, as simple as it might sound, that’s when I realized what to do with all the silence. All the unconsciousness around my life, and the lives lived in my community then needed to be heard. Experienced. And that would be to continue making my art from my perspective. And to encourage others to do the same. I could make sure that there was nothing about us without us. Not by speaking for all of my community (I can only speak for myself) but creating space for us to show up. To be counted. Recognized. And to encourage allies to do the same. Not to take from us our words, but to give us a chance to master them. Because for me this is not just an issue of making art. It’s about life or death. The lives of our community depend on art written, recorded, made by us for us. Like many other oppressed demographics, art is not just a pretty little pastime; it is a vigorous, vicious and multifaceted tool of resistance, recognition and activism. Art, despite many modern cultures and belief systems classifying it as a “hobby” or an “act of leisure” has been humanity’s salvation. Our darkest ages and hours, our moments of brutal subjugation and suffering have been healed and lifted through art. By creating mirrors, antidotes, salves and social and political movements, art is the ally of the activist. Not just the mystic. So, I’ve made a decision, and I hope my fellow brothers and sisters with disabilities will make a similar one: while others question the value of our lives, show them. While others question the “need” for making art, make it. While others question the worth, answer your calling. Come forward for your cause. Don’t fight the silence. When people without disabilities leave you without mention, recognition, or acknowledgment, acknowledge it. Eat it whole, and then write. Draw. Paint. Sing and sign into it. Make it yours. Take up space. Don’t apologize. You’re not just an artist. You’re an activist. A rectangular banner with a background image of a shelf of slim, colorful paperback books, spines out. Over this, a gray rectangle with a black outline. In the center of the rectangle, the text “Disability in Fiction” in larger text, followed by “A blog series hosted by BooksByIntisar” below in smaller text. A square graphic with a background image reminiscent of a diary entry in an old-time journal, written in cursive. 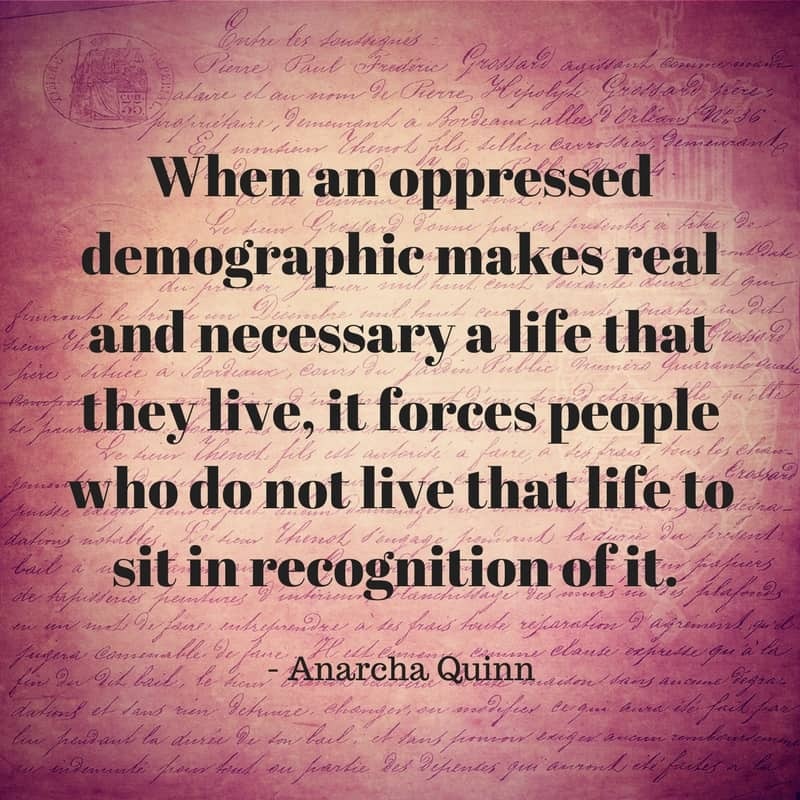 Over this, in black text, the quote, “When an oppressed demographic makes real and necessary a life that they live, it forces people who do not live that life to sit in recognition of it.” Attribution in smaller text below the main quote to Anarcha Quinn. A square graphic with blue, red, and pink coloration in the background giving the appearance of a painting. Over this, in white text, the quote, “This is not just an issue of making art. / It’s about life or death. 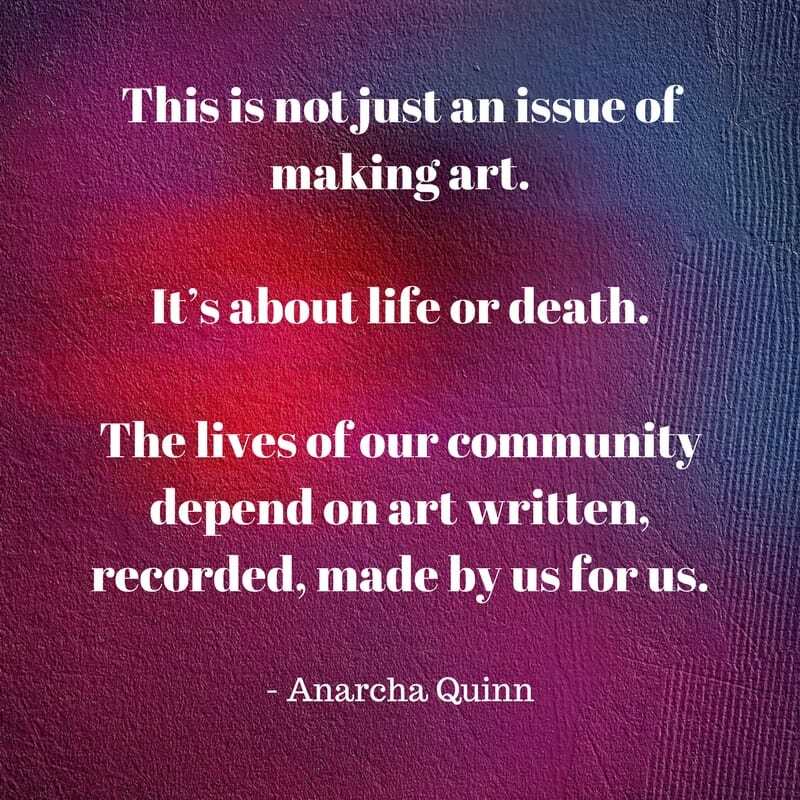 / The lives of our community depend on art written, recorded, made by us for us.” Attribution in smaller text below the main quote to Anarcha Quinn. A square graphic with a textured, paper-like background, with water colors toward the bottom in shade of orange, yellow and mauve. In black text, the quote, “Don’t fight the silence. When people without disabilities leave you without mention, recognition, or acknowledgment, acknowledge it. Eat it whole, and then write. Draw. Paint. Sing and sign into it. Make it yours. / Take up space. 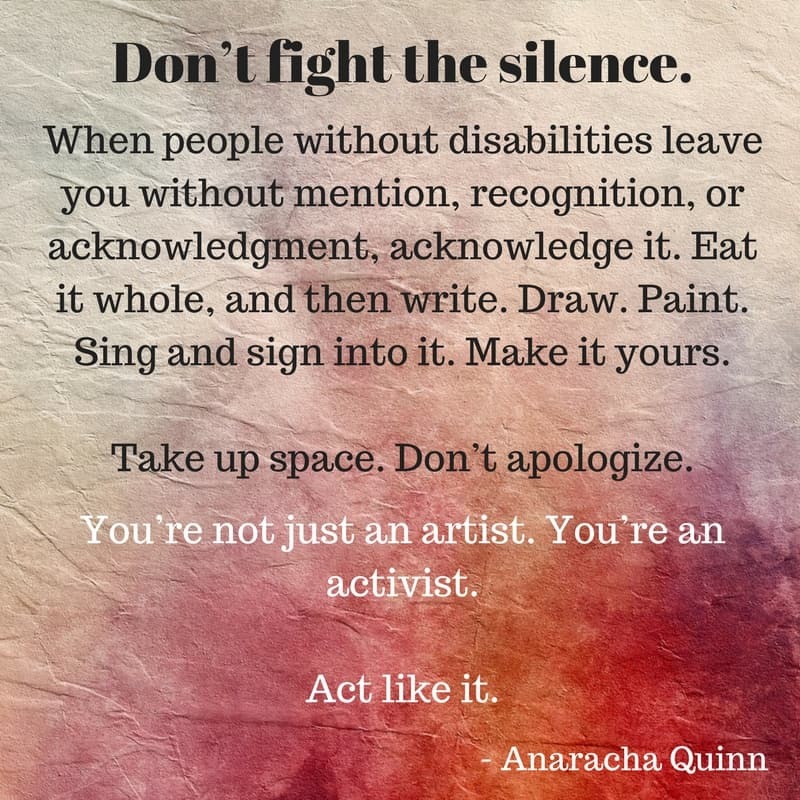 Don’t apologize.” In white text, below this, “You’re not just an artist. You’re an activist. / Act like it.” Attribution in smaller text at the bottom to Anarcha Quinn. Very eloquently expressed! I’m so sorry that your fears have been lost in this. I don’t think the disabled community is being ignored out of ignorance or lack of care. So much is going on at once, everyone’s dizzy and wondering which way to fight and shout. And you are right- that is when art takes form (written, visual, audio) amidst chaos to draw people into other experiences and give direction. Claim your space 🙂 I’ve been seeing others begin to do the same recently.